Demand for high-quality housing schemes has been on the rise in the city of Sahiwal. Tycoon Citi is catering to this demand in a big way, and it is already making a huge impact on the real estate sector of Sahiwal. It has all the facilities that make for a luxurious lifestyle. Whether it is an excellent cinema and gymnasium for entertainment and fitness or lush-green parks and zoo for some reprieve and relaxation after a long day – Tycoon Citi aspires to provide every facility with elegance. The developer has included quality hospitals and schools into its plan to ensure that education and health are taken care of. Moreover, an impressive shopping mall in Tycoon Citi is set to make it a hub of commercial activity. Load shedding – a major inconvenience in Pakistan – is taken care of through backup electricity generators, which ensure a 24-hour power supply. Power outages just do not happen in Tycoon Citi. The area is already developed with all necessary road infrastructure in place. An underground electricity system ensures that unsightly electrical wires and poles do not mar the look of this quality residential project. Quite a few beautiful homes in the area are already complete. A vigilant security staff, helped by continuous CCTV surveillance, protects the society. 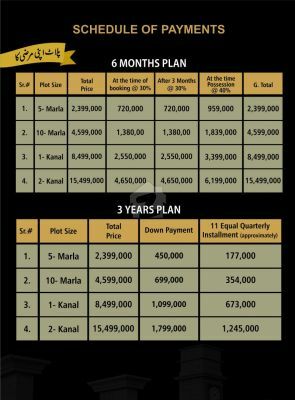 Tycoon Citi offers residential plots starting from 5-marla size, which go all the way up to 2-Kanal. It offers good value for money with a payment plan that has 11 easy quarterly installments, making it an offer that one cannot resist. Tycoon City is situated at just 1 kilometer from main Multan Road Sahiwal. Location of Tycoon City is ideal as it is surrounded by schools, colleges, offices, parks, grounds, commercial centers, entertainment areas, and top road & transportation links. This hot location of Tycoon City will offer the world class living experience. HIM Property is a real estate development company that has had wonderful success since its inception. We have launched many projects, and are delighted by the amazing response from our satisfied clients. Tycoon Citi is our flagship project, which will provide excellent housing to the residents of Sahiwal. Despite the challenges faced by Pakistan’s real estate market, HIM Property never lost its strength. This was possible only because of our talented team, which is fully committed to delivering a top-notch housing project. We believe that companies grow only through an organisational culture that promotes entrepreneurial spirit, attention to detail and professional excellence. These factors are emphasised and reinforced throughout our company. Moving forward, we intend to invest in similar housing projects and grow as a company. The future of Pakistan’s real estate industry is bright, and we aspire to play an important part in its success. We strongly believe on quality of services together will be competitiveness of prices, which gives us edge on all our competitors. Since we are Pakistani by origin, therefor our affection and affiliation motivated us to bring concepts of hygienic coupled with quality and competitiveness to our beloved homemade as well,we can bring our experience and international standards.